Global private equity giant Blackstone Group, which has bought a slew of malls in India in the recent past, has added a new asset in its retail portfolio by buying a 50% stake in Westend Mall in Pune. JLL India facilitated the transaction, the real estate consultancy firm said in a statement. It did not disclose the size of the transaction. Blackstone did not comment on the development. “Westend is the largest integrated mixed-use development in the micro-market of Aundh and Baner, which houses some of the top IT companies and an abundant residential catchment in the vicinity,” said Sanjay Bajaj, managing director-Pune, JLL India. The Westend Mall, part of an integrated project, is one of the largest operational retail malls in western Pune and houses brands such as H&M, Shoppers Stop, Cinepolis, Max and Starbucks. JLL said about a half-million people work in mall’s vicinity, making it a strong case for entertainment and retail. “Against the backdrop of several question marks being raised on the impact of various potential disruptive changes in the real estate sector, this deal underscores the fact that institutional investors are still wired into relevant big-ticket opportunities,” it said. The latest deal adds the fourth retail asset in Blackstone’s portfolio. It had bought two AlphaOne malls in 2015 in Amritsar and Ahmadabad from Alpha G:Corp. The PE giant is in the last leg of acquiring the retail part of L&T Seawoods from L&T Realty, the real estate arm of business conglomerate Larsen & Toubro Group. It was also in talks to acquire a mall from Larsen & Toubro in Chandigarh but was edged out by Carnival Group. These developments are a culmination of Blackstone’s strategy to strengthen its presence in the retail real estate market, a segment that has seen upswing movement after a long gap. 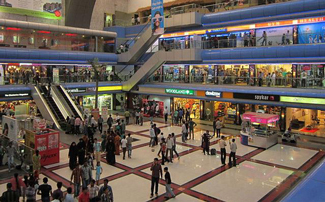 The firm recently set up a separate vertical, Nexus Malls, to house all its retail assets. “It will operate as a subsidiary of Blackstone under which all the malls–the ones which we have and the ones we will acquire–will be under the platform. It will be positioned and branded as a separate entity dedicated to retail assets,” a spokesman for Blackstone had said earlier. He had added that Vikas Garg, principal at The Blackstone Group, is likely to lead the platform while the overall real estate business remains under the leadership of Tuhin Parikh, senior managing director for real estate at Blackstone. While Blackstone stays away from officially commenting on its strategy and deals, industry experts say that it is betting on the growing consumption trend in the country. “With economic stability, consumer sentiment is at an all-time high, so people are going and shopping more. The demographics of the country are very favourable as around 65% consumers are below 35–upwardly mobile, savvy, well connected–so they are spending more and more on brands. And this is expected to increase only,” Pankaj Renjhen, managing director for retail services at JLL India, had said previously. According to a report by JLL India, economic and political stability, liberalisation of the foreign investment policy by the Narendra Modi government and improvement in consumer sentiment are some factors working in favour of the retail real estate segment. “Quality mall space is coming up with strong pre-commitments, which indicates that retailers also remain bullish about the long-term India consumption story,” it said.